This looks shooped. I can tell by some of the pixels and by shooping a few whoops in my time. Looks like he ate a little blonde girl. 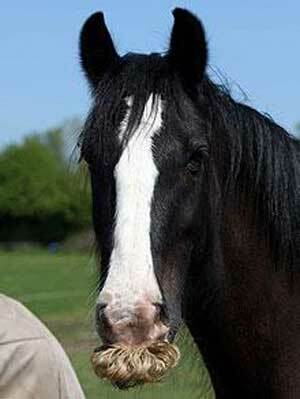 Horse in needs of Nads. Don’t let ’em near you Alfie. Girl horses love a good mustache. My ex had one like that.